was three days away from my NBA dream, and I walked away. It was last August, a few weeks after summer league. I had my contract with the Bucks, a guaranteed two-way deal. Had my flight booked to Milwaukee. Was in the best basketball shape of my life. I was three days away. And I never got any closer than that. Three days before I was supposed to leave Utah, I made the hardest phone call of my life. I called up the Bucks. I told them I wouldn’t be showing up and I explained why. Now I’m ready to tell you why, too. The story I want to tell you starts 30,000 feet in the air somewhere over the Rockies. Our airplane — full of the entire Utah State basketball team — was going down. I was sure of it. It was a year ago, my senior year. The team was cramped into a propeller plane headed to San Jose for a game. Like 30 minutes after we took off, I got an uneasy feeling. The turbulence started and it never let up. I was sure we were goners. Now look, I’ve never liked flying. I’ve never told anyone, but it was just something I tried to avoid unless I couldn’t. I guess it was always just sort of a safety thing for me. I know all the statistics — how flying is safer than driving and all that. But it’s just that — losing all that control always made me a little nervous. Anyway, up to that night, that flight, it was just this tiny thing that bothered me. I’d just put on my headphones, keep my head down, and get through it. I’d think about how much I enjoyed seeing new places, and of course I knew that I needed to fly to play basketball. But man, that flight to San Jose was different. It started with the thumping. Our carry-on luggage was bouncing around in the overhead compartment. My stomach was rising and falling as the plane went up and down. A flight attendant made an announcement: “Keep your tray table up and don’t leave your seat.” We were going down, man, no doubt about it. The thumping was getting louder. I turned the music up on my headphones. Now my heart was thumping just as loud as the turbulence, like it was gonna punch its way out of my chest. I was sweating, so I had the A/C knob pointed right at my face on full blast. I kept both of my legs braced tight against the seat in front of me, and my hands were locked onto each armrest. I started to talk to myself, to try to calm myself down. The plane was going down. My body was telling me, loud and clear: This is the end. And I was sure everybody else on the plane felt that way, too. But they didn’t. The only part of my body I felt was safe to move was my neck, so I’d occasionally peek up to the front seats to check on my dad, who was flying with us that night and to look out of the airplane windows. Each time I looked up at my dad, he was reading his book … like nothing was the matter. How could you be reading at a time like this? All the noise, all the turbulence … and yet most of my teammates seemed calm — some were sleeping, some were talking, some had headphones on. Why wasn’t everyone else freaking out? About an hour into the flight, they said we were landing in Reno to fuel up. On the ground in Reno, I was genuinely just happy to be alive, like we had just averted a disaster. I went up to our coach and was like, “That was the craziest flight ever, right?” And I remember he said, “Yeah I guess so, wasn’t too bad.” And he shrugged. I didn’t want to go back up in the air that same night, but we had to. And to be honest, I don’t really remember that second flight. I had my music on again, but I wasn’t hearing any of the words. We got into our hotel in San Jose at maybe three in the morning. I think we’d left campus at seven o’clock the evening before. It was supposed to be a two-hour flight. Lying in my hotel bed I remember not even getting close to falling asleep. I was exhausted, like I’d just taken a four-hour test, but wide awake. I was on my back with my eyes open and my whole body hurting, staring up at the ceiling and thinking the same thought, over and over and over again, “What the hell is wrong with you?”. My family went wild the day I signed with Milwaukee. A few hours after the draft ended in June, my agent called and said the Bucks wanted to sign me as a free agent. I was going to actually play in the NBA. Everybody was excited — patting me on the back and taking their phones out to call all of our relatives. It was as happy a scene as anything I’ve witnessed in my entire life. But it wasn’t how I was supposed to feel. Even before I hung up the phone, I sensed something wasn’t right with me. I couldn’t feel the tips of my fingers. And my heart was beating out of my chest. It was awful, but strangely familiar. It was all happening again. It was kind of how I felt on that airplane when I thought it was going to crash. Only now I was on the ground. I was in my own house. And I could feel that I was about to lose control. I was about to have a panic attack. Every time I tried to take a breath and calm myself down, it got worse. It eventually got to where I couldn’t even hear what everybody around me was saying.It was just like white noise in the background, and the sound of my own voice echoing through my head. At first just asking all these questions: How are you going to do it? Where will you live? When are you going to leave? What if you’re not good enough? And they’d just keep coming. I wouldn’t even have time to think about rational responses — one question would just lead into the next one. Just this relentless barrage of problems clouding my brain until I was beat down and overwhelmed. Eventually the questions would stop, my heart would slow down, and I’d be able to regain some of my composure. But then there’d always still be that same, unanswered question at the end of it all. The one that would stick with me, day or night, whether I was panicking or not. What’s wrong with you? This is supposed to be the greatest moment of your life. People would kill for this chance. It’s still hard to even think about, you know? Just coming to terms with this idea that for so long, my whole life — every decision I’ve made, every day I spent practicing, putting in work in the gym so I could achieve this one goal … and then you’re in that moment and it’s not how you imagined it. You don’t feel the way you’re supposed to feel. I’ve never been great about sharing how I’m feeling, even little things when I was a kid. So I definitely wanted to hide this. If I could just get to Milwaukee, I told myself, I’d have made it. As the summer went on, the strange sensations got more frequent. But I still didn’t tell anyone. I was home with my parents and my brother, Grayson, in Logan for most of the time. I went to summer league and it went pretty well. Back in Logan, I was working out every day and it was going well, too. But mentally, it was all getting worse. I was starting to have trouble falling asleep. My mind would race when I lay in bed, a jumble of thoughts sprinting around. I’d just get so deep into these swirling questions in my head and start thinking about my heart and my brain giving out. My fingertips would go numb. And a lot of episodes of sweating. Sometimes Grayson would catch me daydreaming in the middle of something he was telling me or a video game we’d be playing. He could always tell when this would happen, because I would start to twirl my fingers in my hair and start to make a face like I was in thought. He’d be like, Jalen, where’d you go? What are you thinking about? He’d literally have to snap me out of the trances to see if I was alright, but I still never told him what was wrong. Then one day this summer I sat down with my phone in hand and I googled the word anxiety. I remember how embarrassing it was to even type. Then I saw the symptoms. Fatigue, sweating, heightened heart rate, unwanted thoughts. I pretty much checked all of the boxes. They were all the same things I was going through. Defining the problem didn’t help at first. That whole summer I’d start to have panic attacks in random places — I could be walking through the mall, eating with my friends, anywhere. I know it’s awkward to say, but if I thought too much about myself, I’d lose it. If I closed my eyes and said to myself, How are you feeling, Jalen? … in five minutes I’d have to be back in my room, lying in my bed. Inside, I felt like I was keeping a huge secret. 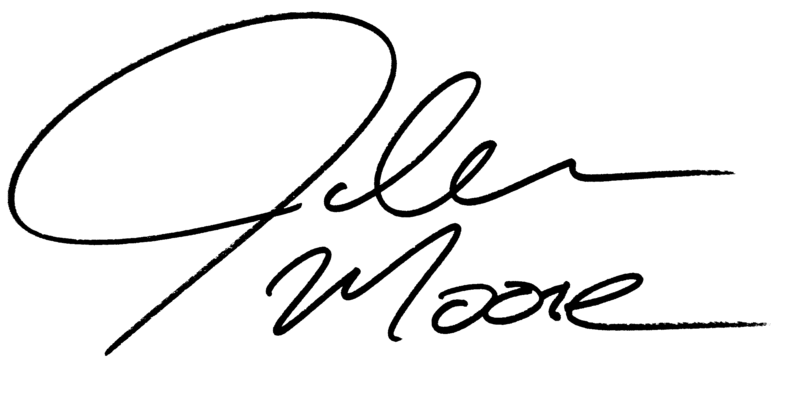 I remember looking into the bathroom mirror that summer, telling myself: I’m Jalen Moore. I’m going to be an NBA player next year. If it’s going to be something, let it be my knee or my hamstring. Let it be physical. Not this. Three days before my flight to Milwaukee, I knew in my own mind that I couldn’t go. There was no way. But I didn’t know how to tell anyone. The thing I was most terrified about — more than telling the Bucks — was explaining it to my parents. I was about to crush them. I paced around my room for maybe an hour trying to think of what to say. My parents — they had worked so hard to help me achieve everything. The idea of telling them I couldn’t do it after we had all come so far, had been giving me anxiety for weeks. I didn’t want to be a quitter. In sports, you never want to be a quitter. I walked upstairs that day and just let it all out. It was me, my brother and my mom and dad in their bedroom. I told them. I told them that I wasn’t ready to play in the NBA. I told them about the symptoms I would get on airplanes. I told them about my panic attacks over the summer. I told them something wasn’t right with me, and I needed to fix it before I thought about doing anything else. And I cried. To my surprise, they said they understood. We hugged for the longest time — a family hug. Everyone was crying. I think it’s the first time my dad had ever felt like he didn’t know everything about me. They told me that they’d do anything they could to help me take care of what was wrong. They were sad, but not because of my decision. They felt bad that I hadn’t been able to tell them what I was going through until that moment. We talked for hours over the next few days. Honestly, it was such a relief — just telling someone. I had been so worked up about telling them. It felt like a huge weight was lifted off of my shoulders. In a way, the way my dad responded was the most surprising and amazing. My dad and his brother grew up in Mississippi. Hard Times, Mississippi, if you know what I mean. So I always knew my dad loved me, but he was sort of about that tough love. Discipline. And his parenting played a big role in my development as an athlete in the most positive way. But we didn’t really communicate our feelings with words. So yeah, I’m sure it was hard for him to swallow the fact that his son’s mental health was what was keeping him from the NBA. But at the end of the day, he loved me. My whole family did. And a few days after I told them, I can honestly say I felt a little bit better. At least my family knew the truth. I didn’t have to hide in the dark anymore. For most of my life, I set out to achieve this one goal: playing pro basketball. The truth is that basketball was — and honestly, still is — everything to me. I don’t love the game any less. I spent every day for 22 years working to becoming an NBA player. When I first started having anxiety attacks, I dismissed them. On some level, I probably knew they were a threat to my goal. But they didn’t go away. A week turned into a month, which turned into a year. And every single day I felt bad. For an hour or two on the court I might be able to escape it, but even sometimes while playing I’d just get this overwhelming feeling like I had this unfixable disease that was making my life hell, and I was letting it eat away at me from the inside. It took a long time to work up the courage and tell my family, and it took a long time for me to feel “man enough” to admit to my parents that something wasn’t right with my mental health. It took a long time for me to admit to myself that I was miserable. I didn’t want to be 22 and miserable. Today I’m back in Utah, still trying to get figure out how to feel better. At first I was embarrassed to have to go home. It was like … failure. If I went anywhere with my brother, even to Walmart or something, I’d want to just sit in the car, too afraid to be seen in public. I remember being in the car, physically not able to get out. Grayson would give me this look. So he’d go in alone. Every time. It’s sort of absurd when I write it, but it’s true. Logan was still my home, but now home for me meant dodging the people I grew up with and avoiding their questions about why I wasn’t in Milwaukee. If I walked around in public, people would spot my fro from a hundred yards out. It would be nice to say that every day gets a little easier, but it’s not that simple. Some days are easier. Some are more difficult than others. I talk with a therapist regularly. I work with kids at basketball camps in my free time, and I really enjoy it. I work out daily in the weight room and on the court. I still love basketball. Will I play again? I’m not going to rule out anything. Right now I feel so much better than I did a few months ago. For me, that’s a good place to be. I’m hoping that I’ll play again, and I’m working to make that happen. Thank you for reading about my experience. I’m not sure I have any easy trick for you if you’re reading this and you’re also struggling. But if I do have one piece of advice, it’s to find someone you know who cares about you and tell them if you’re having a hard time. I noticed that talking about things can always help, and don’t be afraid to get help. Mental health is real, and can be helped, I don’t think our country talks about it enough. If you have mental health issues, you are not crazy, you are one of many, and every battle can be won! After going through this, I believe that setbacks and uncomfortable experiences can make us better. It just won’t happen all on its own. We’ve just got to talk about them. They’re not something to hide.